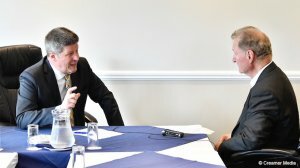 JOHANNESBURG (miningweekly.com) – Hydrogen is at the centre of the solution to climate change and platinum, in turn, is at the centre of hydrogen, London-based Anglo American executive head of market development Benny Oeyen emphasised when he spoke to Mining Weekly Online on the sidelines of this week’s Platinum Group Metals (PGM) Industry Day. He elaborated on using wind and sun to liberate hydrogen from water, and platinum then catalysing the hydrogen into electricity in fuel cells capable of powering cars, trucks, buses, trams, trains and ships cleanly, in a world that is legislating to end harmful vehicle emissions. “From start to finish, not a single gram of carbon dioxide is emitted,” Oeyen highlighted. The second big advantage of hydrogen, cited by Oeyen, is its ability to store excess electricity for placement on power grids at times when the wind is not blowing or the sun is not shining. “But when you have a lot of wind and solar, you can split water into hydrogen and store the hydrogen for a day, a week, a month, a year or ten years, and when you have no wind and no solar, you can put it back into the grid, completely emission free. That’s the future we believe in. It will solve the emissions problem in transportation and also solve the emissions problem in energy in general,” he said. A third big advantage is the 600 km to 700 km range of hydrogen fuel cell vehicles and their ability to fill up in two to three minutes at filling stations. If decarbonisation is to be achieved, there is no way around fuel cell electric technology – and the world is recognising this fast, added Oeyen. Honda, Toyota, Hyundai and Shanghai Automotive International Company (SAIC) Motor Corporation of China have fuel cell cars on the market. SAIC, which is the joint venture partner of General Motors and Volkswagen, the two market leaders in China, has the Roewe 950 fuel cell car. “I can tell you that almost every automotive manufacturer is looking at fuel cells because they all know that if you want to decarbonise and have no emissions, all C and D segment cars, family cars, and everything that transports goods long distance, will have to be fuel cell driven,” said Oeyen. Governments are also getting behind hydrogen fuel cell travel, notably those of China, Japan and Korea: “The Chinese government is four square behind hydrogen. There’s a chapter in their five-year plans about new energy vehicles and new energy sources, and there’s a whole chapter on hydrogen. They have a very clear plan and they want to develop a hydrogen corridor along Yangtze river, which enters the sea in Shanghai. They are providing big subsidies for hydrogen cars and for hydrogen buses. China is completely behind fuel cell vehicles. “The Japanese government really wants the country to become a hydrogen economy and the Tokyo Olympics in 2020 are already being dubbed the Hydrogen Olympics because they’re going to showcase vehicles and everything is going to be hydrogen-based, and the same is now true of Korea,” said Oeyen, who predicted the emergence of ever-widening consumer choice in the fuel cell vehicle field in the next ten to 15 years. Envisaged is a patchwork of power train solutions in the next ten years, with the internal combustion engines still driving demand for PGMs, battery electric vehicles taking up some of the short-distance markets, and fuel cell trucks, buses, trains and ships starting to gain traction. “Platinum is currently the best catalyst in a fuel cell and I think it will remain so for a long time,” said Oeyen. If fuel cell electric vehicles capture 7% of the current PGMs demand of three-million ounces a year, they will be at the same level as the current demand for PGMs created by autocatalysts. On the mining front, Anglo American technical director Tony O’Neill hopes to have a truck running on hydrogen in the next 12 months. A graphic displayed during Anglo American’s sustainability presentation earlier this month showed solar panels providing electricity for the hydrogen used by haul trucks and highlighted the delivery of enduring value through the transformational use of renewable energy. The approach adopted is to produce hydrogen with excess photovoltaic power and then allow for the hydrogen to be consumed in trucks as a way of achieving energy security, price resilience and lower greenhouse-gas emissions. Sustainable energy focused consultancy E4tech said in a review of the fuel cell industry last year that global fuel cell power shipped grew by 30% to 670 MW in 2017, and units by 15% to more than 70 000 systems. Asia led significantly in unit numbers, with 80% of the additional systems. In megawatts, Asia and North America have been neck-and-neck since 2015, and are competing for the lead – with 95% of the market between them, the consultancy reported.